Here's a brief comparison of the three most used online ticket sales websites in the Philippines. With SM Tickets, you can view events based on category. There is also an option to find shows according to venue. While most events are held in SM affiliated locations (i.e. MOA Arena, SMX Convention, etc. ), there are also third party places included such as Star City, Enchanted Kingdom, Sun Cruises, Zoobic Safari, Crown Regency Hotel, and more. Most major concert events of popular artists use this site for ticketing. Registration is the usual email route as registration is not yet integrated with social media. Purchasing is at least safe. The card used for payment must bear the same name as the registered user. Even for claiming and printing, it should be done by the person whose name appears on the card. Seats can be manually selected. Make sure to complete your transactions within the allowed time frame (10 minutes) though; otherwise, any reservations of seats are freed for the next customer. 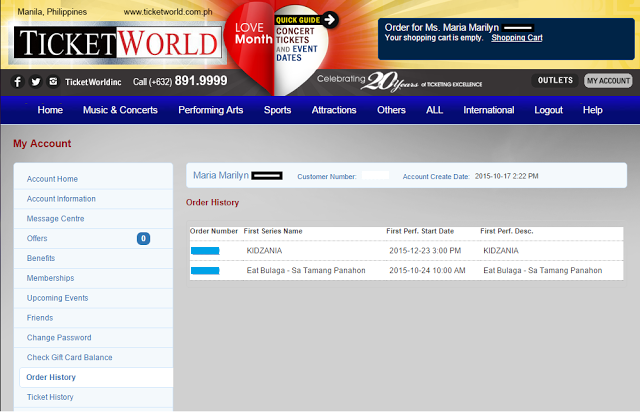 Ticketnet Online makes it easier to find categories. These are placed right on top. Some of the best shows are also listed through a slide below the site title. Compared with the SM Tickets website though, there are fewer events to choose from here. But at least there's no need to register in order to make a purchase. You will still need a credit card and an email for confirmation and other instructions though. Choosing seats is also easy. There is an option to select the best ones available per category (VIP, Lower Box, Upper Box, etc). The system will then assign a seat automatically. You can also conveniently print the ticket at home. If SM Tickets is obviously for SM, TicketWorld is for Ayala so expect most venues to be affiliated with this group; the same applies to outlets where you can redeem the tickets. Like SM, registration is required and also needs the card holder to appear during the claiming and printing of tickets for security purposes. And like TicketNet, there's an option to automatically let the system choose the best seats. What's the best among the three? It depends on which advantages you prefer.